1 packet of fresh coleslaw mix (the dry stuff from the salad section at your local grocery store). If you can’t find any, 1/2 cabbage and 2 shredded carrots will do the trick too. 1. Mix the coleslaw in with the shrimp. Make sure you clean and de-vein the shrimp beforehand. 2. Add a 1/2 of a teaspoon of all the spices listed above including 1/2 teaspoon of salt. Add a handful of fresh chopped up coriander to taste. 3. Add about 5 tablespoons of gram flour (note, pakoras won’t work with any other flour). Add some cold water to the mixture and stir in properly ensuring there are no bubbles in the flour. You want the consistency to be smooth, heavy and not too watery otherwise it will be difficult to fry. (If you want to make it spicy, add some chopped up green chillies at this point and stir into the mixture). 4. Using a spoon or your hand, just pick up the mix and place it into hot oil. The pakoras need to be deep fried until golden brown and crispy. 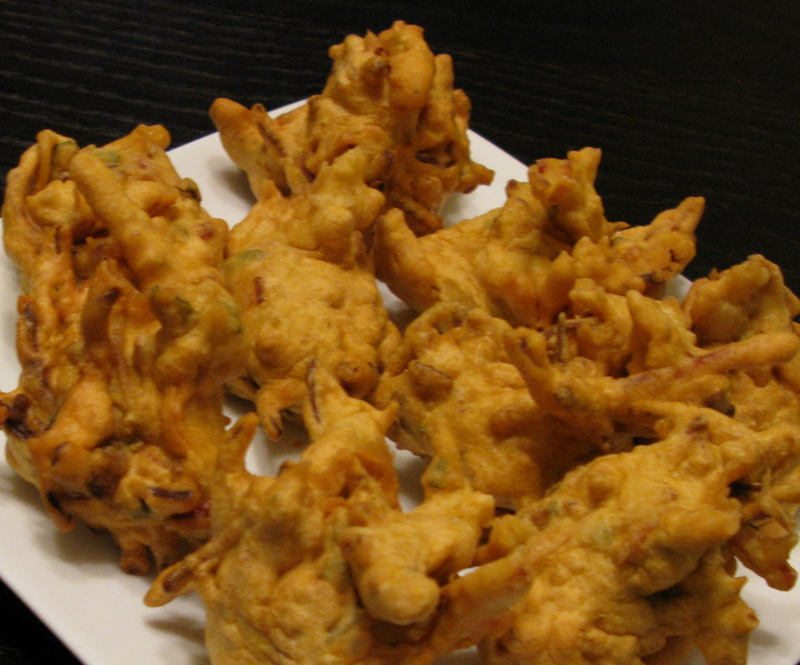 Recommendations: Pakoras are best served hot and can be served with a variety of sauces including any type of hot sauce, plain yogurt, or tamarind sauce.